On May 14, Ohio University students began registering for fall classes. Although registration appeared routine, it bore one very important difference from quarters past. Students were no longer registering for quarters. Beginning in August of 2012, OU will operate on a semester calendar. The transition will not only bring changes to OU students’ academic calendar, graduation requirements and fest season, it will alter their curriculum. The OU Board of Trustees approved the transition to semesters in October 2008 after state officials urged all public universities to make the change. Since 2008, the university has been planning for the transition process. OU has been on the quarter system since the late 1960s when it switched from semesters to quarters. Dr. Robert Stewart, Director of the E.W. Scripps School of Journalism said that the university first notified him of the change about three years ago, allowing plenty of time for the journalism school to adjust its requirements. The E.W. Scripps School of Journalism took advantage of the semesters switch as an opportunity to adjust its curriculum to better fit the evolving industry. “When we knew we were switching to semesters, once it became crystal clear that the university was going to make this change, we realized that this was really an opportunity to do a substantial top to bottom overhaul,” said Stewart. However, the school of journalism was not the only group to make important changes. As Stewart noted, on a semester system, students take fewer classes and fewer overall hours. As a result, all colleges and majors needed to make adjustments. 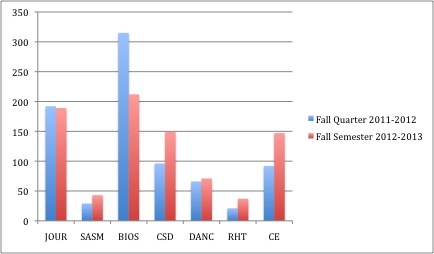 The graph compares the number of courses offered in several programs across colleges of study at Ohio University between Fall Quarter 201-2012 and Fall Semester 2012-2013. Under semesters, students are required to take fewer courses. Angela Lash is the Assistant Director of the Allen Student Help Center, the hub for Q2S questions. Since the 2011 fall, the Allen Student Help Center has branded itself as the resource for Q2S concerns and has helped many students through the process. Lash said that she has seen students of all ages from all colleges about the transition. She did not notice any recurring major issues, nor did she think that students from a particular college or major brought the most concerns. However, first year students and underclassmen have been more likely to visit the Allen Student Help Center about the transition. Lash explained that this trend is normal, as the help center is primarily a resource for first year students and for students with undeclared majors or who are applying for a major. The Allen Student Help Center has mostly answered “simple questions about the impact of the transition” said Lash. These questions include: changes to credit hours; curriculum changes; class times and schedules, especially the increased regularity of Friday classes; and accessing both the old and new catalogs. When faced with more complex questions, Lash said the center would answer as many concerns as possible, but would be sure to refer students to the “experts,” their regular advisors and transition advisors. As students have come to the help center with concerns, advisors always start by asking she students an important question: Have you completed your TDCP? OU requires all students to complete the Transition to Degree Completion Plan (TDCP). The plan maps students’ academic requirements to ensure that they will be able to graduate “on time.” All current freshmen, sophomores and juniors were required to complete the plan by May 1. Seniors planning to graduate in June also had to meet with their advisors and sign a form declaring that they would complete their degrees before the switch. As the Allen Student Help Center looks to the fall, Lash predicts she will encounter many of the same questions as this spring, especially those regarding adding and dropping classes. She advises students to continue reading their emails and to pay attention to official university communication as the transition progresses. Students are always encouraged to visit the Q2S website, where the university has compiled its resources to help students through the change and to answer their questions. Giovanna DelGarbino, a sophomore studying Strategic Communication in the E.W. Scripps School of Journalism, joked that the semester transition ruined her life. “Not, really. Everything I needed I was able to get done,” she said. Transition aside, the Youngstown native looks forward to the semester calendar. “I’m excited to be on semesters, to be on the same schedule as other schools and to have less stress and so many classes a year. At the same time, the stress of switching is overwhelming,” said DelGarbino, who thinks the transition has been as tough on advisors as it has been students. During her advising process, DelGarbino felt that her advisor was extremely helpful, just not prepared to answer all of her questions. “I felt as if the process to get the answers to my questions was a chain of reactions from the higher-level people at Scripps to the lower-level people,” she said. DelGarbino began preparing for the transition as soon as she was accepted into the journalism school at the beginning of Winter Quarter 2012. She expects to have to take summer classes or stay an extra semester to finish her education. But, DelGarbino doesn’t blame the journalism school for the delay. She also plans to earn a business minor, and attributes her delay to changes from the College of Business. College of Business student Matthew Witten, however, has had a positive experience with his college. Witten is pursuing dual degrees in Business Marketing and Sports Management with a Business Minor, and says that his school has been extremely flexible and willing to work with him. When Witten began his studies, the Sports Management degree was house outside of the College of Business. Because he dedicated so much time to completing two degrees, the College of Business will grant Witten two separate degrees when he graduates in May 2013. Witten does not know if the decision to realign of the majors relates to the transition. With the transition, few of Witten’s requirements changed. Although he personally found the transition easy, he can identify a major source of frustration. Witten said that the College of Business is reducing its hour requirements to correspond with the semester plan, but he feels it has not significantly reduced the number of classes. Witten may have had the option to graduate early at the end of winter quarter had the university not switched to semesters. Now, he will graduate on time. Like Witten, junior Mo Farunia has had positive experiences transitioning with his college, the College of Health Sciences and Professions. The Health Services Administration major transferred from a community college to the Athens campus in the fall of 2011. He said that his advisor has helped him prepare for the change since the beginning. Overall, Farunia says his professors have been wiling to write pinkslips and his college has been flexible with requirements to ensure that no student is delayed because of the transition. The start of scheduling marked the reality of the Q2S transition for many students. As August approaches, so too will the challenges and changes of the semester transition. Dr. Robert Stewart, E.W. Scripps School of Journalism Director, explains the department’s process of revising the curriculum for the semester change.